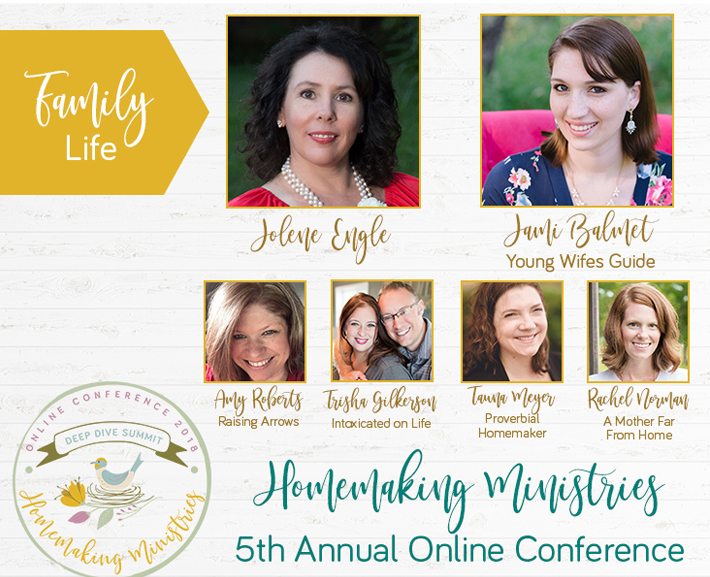 When my third baby was born at the start of the year, my whole system for homemaking was completely thrown into a wrench. 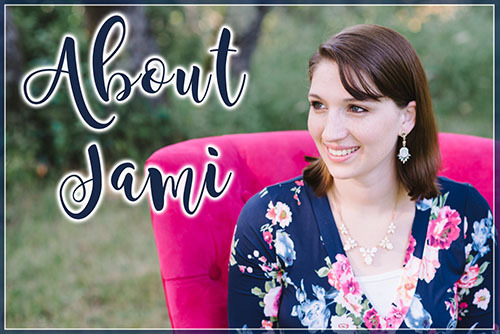 Trying to balance life, a home, blogging and writing with my family which includes an amazingly supportive husband, a 4 year old, 2 year old and the newborn, completely threw me off my game. I gave myself grace those first few month of newborn baby bliss and just did the bare minimum and accepted help whenever it was offered but as my baby started to grow and sleep a tad bit more consistently, I realized I needed to start getting back to my philosophy of intentional homemaking. With three little ones I knew that I wouldn’t be able to go back to my old routines, I would need to create new grace-based ones. As I was thinking through how I wanted to structure my days, I read somewhere about transforming your mindset from routines to daily rituals — things that you do naturally to make up your day. They feel more simple and graceful, so I started to carve out my days based on a few rituals that I practiced every day. It sounds so simple, but over the past few months I have started the day by simply lighting a candle. 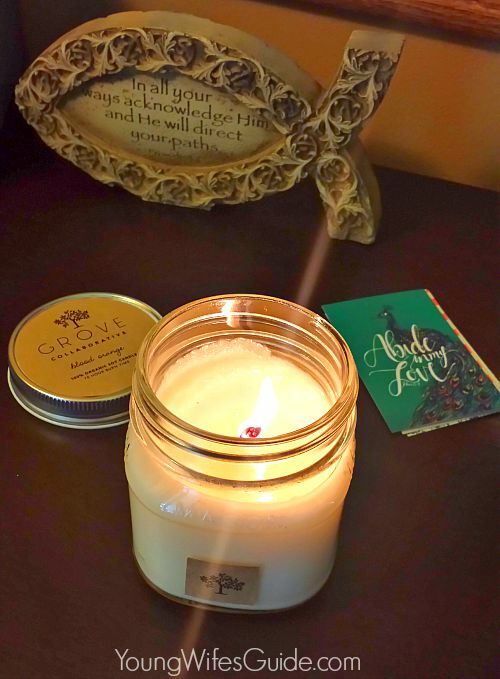 I don’t know if it’s the soft, warm glow or fresh, inviting scent but by having a candle lit on the kitchen counter inspires me to tackle my day. It also helps with the mid-afternoon slump where I have no energy. Lighting a candle and resting for a few moments helps reenergize me for the rest of the afternoon and evening routines. I would love to spend my first moments of the day in the Word but to be honest in this season of motherhood, some mornings I am waking up to my kids instead of before them. I know that soon I will be sleeping constantly through the night again and will even have children who sleep in (it almost sounds like a dream!). 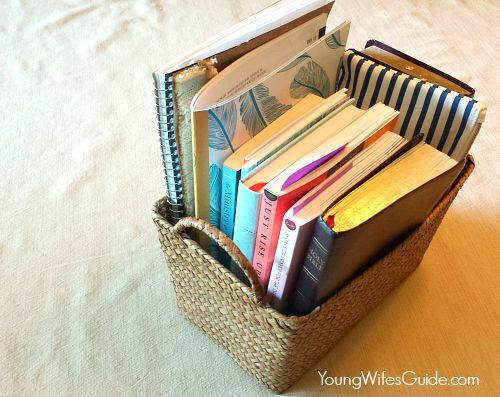 When I don’t get the chance to have a devotional time before my kids wake up, I always make sure to be in the Word before I start checking Facebook or doing other online blogging business. I’ve let go of the self-imposed guilt that to be in the Word means I’m reading an actual Bible. Instead I’ve embraced Bible reading apps such as YouVersion and She Reads Truth to read while I’m nursing or embracing an early morning cuddle with one of my kids. I’m in love with my paper planner. I know many swear my their calendar apps but I love putting my dates, notes, to-do lists and other thoughts down on paper. There are many wonderful planners out there, I personally use and love the Emily Ley Simplified Planner. 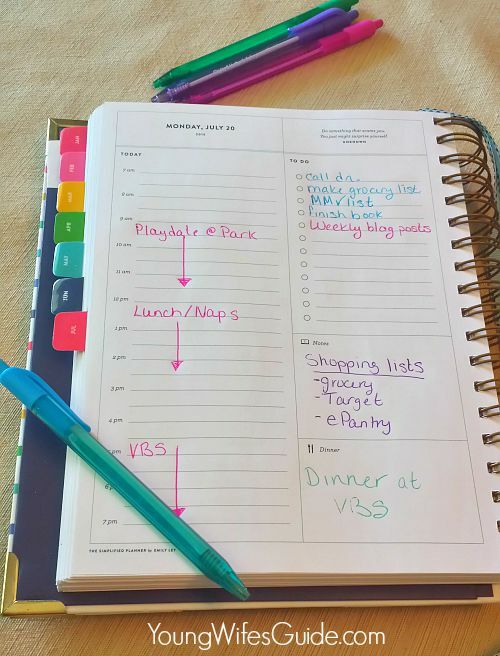 Every Sunday evening I sit down and go over the week with my husband then I fill in my calendar to include any errands I have to make, appointments, activities and meal plans. I also write out a few weekly goals with grace to help guide me. Then every morning I sit down and review my calendar and write out a simple to-do list based on my goals and activities I know I have planned. I’m really good at overestimating the amount of time I actually have, so I am currently limiting myself to write down no more than 5 daily t0-do’s. Before I became pregnant with my third, I had a really good cleaning routine down but the exhaustion of pregnancy and raising two other little ones really took a toll of me. I gave myself grace to surrender the cleaning plan and adapt to a cleaning routine that fit into my busy days. Currently I have been using the Motivated Moms cleaning checklist for the past year and I love it! Instead of doing elaborate deep cleaning days, I have started to do small simple cleaning tasks each day. For example instead of cleaning all the bathrooms top to bottom one day, I break up the chore into smaller tasks. One day I will clean the toilets, the next I will wipe out the bathtubs and showers. Every morning after we are all dressed, I will wipe down the sinks and replace the hand towels. I’ll admit that at first it seemed really strange to adapt to a tidying up cleaning ritual but as I’ve been cleaning this way for over a year now, my home actually stays clean because I’m doing a little bit of cleaning and tidying up everyday and not just waiting for the bathroom cleaning day. As moms we are often the worse at fueling ourselves because we tend to be so servant oriented to meeting the needs of our family. However if we don’t spend a few minutes everyday doing something just for us, we will easily burn out. I use my kid’s nap time to fuel myself. I don’t do any cleaning or chores, instead I will spend that hour or two either resting (either by taking a nap myself or settling in on the sofa to watch a show), reading, working on blog or writing work or even giving myself a much needed pedicure. Earlier this year I read the book The Fringe Hours: Making Time for You, in it Jessica Turner makes the case for taking back small pockets of time throughout your day in order to practice self-care and do the things you love to do. It is so freeing to give yourself grace each day to spend some time on yourself. I actually have found that when I do this, I am more energized and refreshed and have more time to tackle the other important tasks that need to get done. 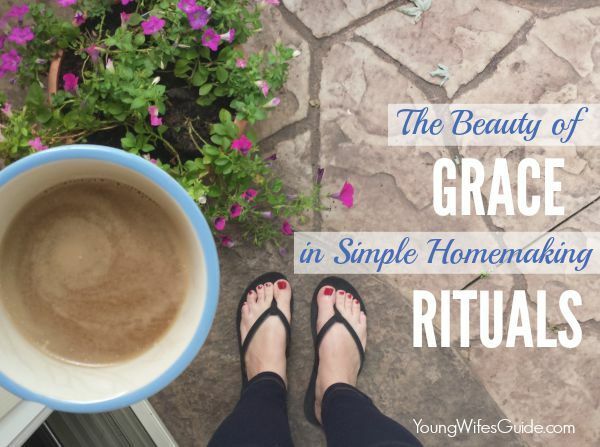 What homemaking rituals do you practice everyday? I really agree with the importance of fueling ourselves too. This is something I have only recognized the importance of since my third was born. Ever since her birth, I have tried to consistently allow myself some down time during afternoon naps. What I do isn’t as important as making sure it’s quiet and I’m by myself! Jenna it took me a while too, to fully accept that my schedule would be radically different after my 3rd was born. Each new child and season brings different difficulties but it also brings great joy. I hope you can settle in on some rituals that will help guide you through your days now as a mama of three. You are doing great! Such an encouraging and well-thought out post. Grace. Truly the antidote of fear, which tends to contaminate so many aspects of my life roles. I have come a long way (by grace) from where I was but there are so many more opportunities for growth. Thanks for the reminder that its not so much about the work but the resting “in” the work. We can work without fear because He has won the battle already and we don’t have to wonder what the ultimate outcome of our efforts will be. A child of God is already victorious. Just thinking about that makes me just “breathe” when I feel gripped by impossible (mostly self and culturally imposed) standards. When I read this post it made me “breathe”, thank you. “Its not so much about the work but the resting “in” the work. ” <– well said Veronica! What planner do you use? I love the way it’s set up. I want to try that planner out this year! Love your post. I am relaxing just by reading the grace-filled words of you ladies. Be blessed. Me too!! Having it written on paper is so much more helpful to me than having it stored in my phone or on my computer! I am new to this. I would love any tips you can give. This was an awesome read and I’m going to give some of the things in it a try!